New photographs of some 80 young elephants that are being held in a heavily guarded facility in Zimbabwe suggest that the elephants are under extreme duress, according to an expert familiar with the animals' behavior. The elephants, who were snatched from their families in the wild, are being held in a facility in Hwange National Park. 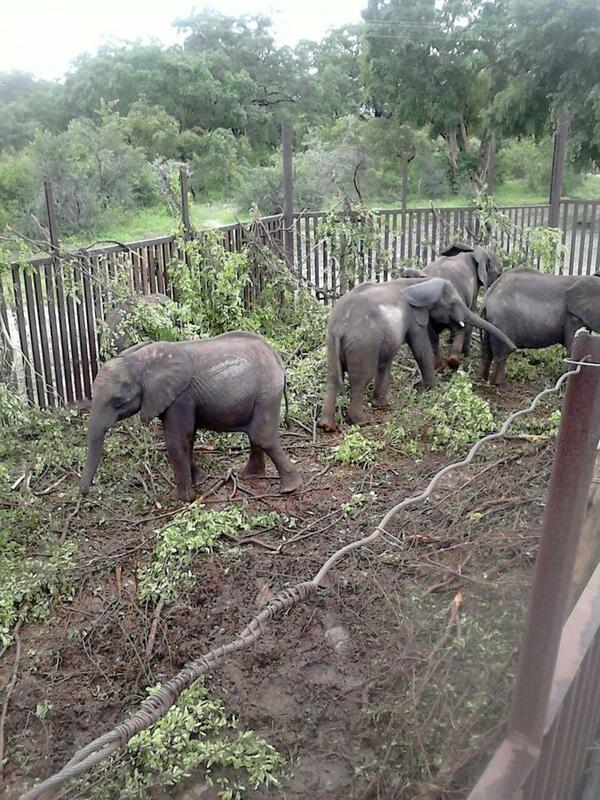 Their captivity is part of a plan by the Zimbabwe government to capture and sell dozens, perhaps hundreds, of young elephants to unidentified foreign buyers. Sources in Zimbabwe say the elephants, estimated to be about four years old, will be exported imminently. Elephant behavioral expert Joyce Poole, who examined the photographs, says that some of the young elephants in the images appear to be stressed and alarmed. Of one shot of a female calf, Poole wrote in an email: "She is clearly frightened by what she sees, smells, hears on the other side of the bars." Zimbabwe's plan to send the young elephants overseas has drawn criticism from many wildlife conservationists. They see the government's plan as a cynical and cruel move against an animal that is being slaughtered at alarming rates for its ivory, especially to satisfy demand in China. Poachers killed 100,000 elephants from 2010 to 2012. Kelly Landen, the program manager for Elephants Without Borders--a Botswana-based organization that monitors elephants' cross-border migrations in Angola, Botswana, Namibia, Zambia, and Zimbabwe--wrote in an email that considering "present global efforts, campaigns and support to combat poaching, illegal wildlife trafficking and animal welfare, the world has remained largely silent about this, an issue that must be the most notorious case of wildlife abuse in recent history." Zimbabwe has cast its plan--which is legal under CITES, the Convention on International Trade in Endangered Species of Wild Fauna and Flora--as a lawful effort to cash in on a natural resource. A January 20 paper by the Ministry of Environment, Water and Climate, titled "Zimbabwe's Position on Live Sales of Elephants and Other Wildlife Species," elucidates the country's new plan to aggressively cull, capture and export elephants (Read: Zimbabwe's The Herald: "Live Elephant Sales Better Than Culling.") Zimbabwe officials say the elephants will be sold for $40,000 to $60,000 each. Last week, Saviour Kasukuwere, Zimbabwe's Minister of Environment, Water and Climate, reportedly said that the funds raised by exporting the elephants will help provide salaries to the country's wildlife rangers, who otherwise would themselves turn to poaching elephants for money. Biologist Mike Chase, the founder of Elephants Without Borders, opposes Zimbabwe's approach: "Capturing wild elephant calves is counterintuitive to raising funds for conservation. It is a gross violation of animal welfare and might repel would-be visitors to a national park that has an exemplary ecotourism reputation." The new photographs of the captured elephants in Hwange were obtained recently by a U.S. security firm that is orchestrating an undercover information-gathering operation about Zimbabwe's elephant export program. The images were provided to National Geographic by the security firm. The firm's president has requested anonymity because of the sensitivity of the situation. Wendie Wendt, the former executive director of the Big Life Foundation, a conservation organization in East Africa, and former vice president and fundraising director for U.S. Friends of the David Sheldrick Wildlife Trust, has been the driving force behind the operation. Wendt engaged the help of the security firm in January and has been trying to learn when and how the elephants will be shipped out of Zimbabwe and where they might end up. The security firm Wendt hired is working closely with a primary source in Zimbabwe. National Geographic has been in contact with this source through the firm. The president of the firm says the source is trustworthy, based on previous work with the source. According to the firm's president, the sources providing information to him about Zimbabwe's elephant sales program are doing so with fear of reprisal or even death. Poole, the co-founder of ElephantVoices, a research and advocacy organization based in Kenya, has been speaking out against the capture of baby elephants since the 1990s, when she went to court in South Africa as an expert witness in a case that involved the capture of 30 babies in Botswana. Poole says the young captives in Zimbabwe appear to be about four years old. "For the most part," she wrote in an email, the elephants "do not look thin in their bodies, but they do look thin in their faces. Their faces have the pinched look that we recognize in young elephants who have lost their mothers or have been captured. I have seen this look many times in wild elephants who have been orphaned." The source in Zimbabwe reports that the capture facility in Hwange National Park is being monitored by 15 national park guards equipped with AK-47s, radios, flashlights, and handcuffs. The property is also under surveillance by hidden cameras. "Some guards," the source wrote in an email "spy on other guards as well, being paid $5,000 a month and some allowances to keep mum on activities." According to the source, some elephants are being held in groups of two in a separate facility closer to Victoria Falls, near the border with Zambia. The source also says that at least one elephant there has died in a fight with another elephant. The destinations of the young elephants--as well as their buyers--are still a mystery. 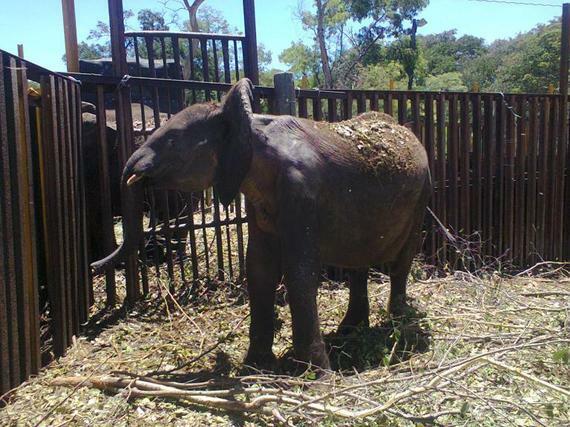 This story is the fourth in a series on the captured Zimbabwe elephants. To read the rest of this exclusive National Geographic article, see more photos, and review the entire series, please click here.